TSPSC Assistant Physiotherapists Recruitment Hall tickets, Preliminary Anwer key, Main Anser Key, Results, TSPSC Assistant Physiotherapists Recruitment 2017 in Telangana State: Telangana State Public Service Commission(TSPSC) has published the Assistant Physiotherapist Recruitment 2017 notification on 15-08-2017(notification 45/2017 dt.15.08.2017) and Applications are invited Online from qualified candidates through the proforma Application to be made available on Commission’s WEBSITE (www.tspsc.gov.in) to the post of Assistant Physiotherapist in Insurance Medical Service in the State of Telangana. TSPSC Civil Assistant Surgeons (Specialists), DA, Tutors, Lecturer in Radiological Physics and Physicist, Civil Assistant Surgeons(CAS) and Asst. Physiotherapist Vide Notification nos. 40/2017. 41/2017, 42/2017. 43/2017, 44/2017 and 45/2017 Preliminary Answer Keys: TSPSC has conducted written examination for above notifications No.40 to 45/2017 on 23-10-2017 and 24-20-2017 FN an AN. The preliminary keys of these exams will be available on TSPSC website from 30-11-2017. The objections on the preliminary keys will be accepted online on TSPSC Website from 02-11-2017 to 08-11-2017. Candidates are advised to note thr above dates and submit their objections through the link provided. Objections received beyond 08/11/2017 will not be considered at any cost. The candidates are instructed to submit their objections only in English and only as per the order of question appearing on the screen with the questions numbers allotted by TSPSC. For further details please visit TSPSC Website. TSPSC.GOV.IN. TSPSC has conducted Written Examination for the above notifications on 23/10/2017 & 24/10/2017 FN & AN. The last date of receiving objections on the Preliminary Keys which was declared as 08/11/2017 is now extended upto 15/11/2017. Candidates are advised to note the above date and submit their objections through the link provided. Objections received beyond 15/11/2017 will not be considered. The candidates are instructed to submit their objections only in English and only as per the order of questions appearing on the screen with the question numbers allotted by TSPSC. The candidates, who have applied for the above recruitments, are hereby informed that in recent recruitments it is observed that, the candidates are often committing mistakes in filling Bio data in their respective applications and requesting TSPSC for Bio data corrections in their respective PDF applications. But it is not feasible for TSPSC to make corrections in candidate’s respective applications, as it is the candidate’s responsibility to fill the application form correctly. In view of the above, it is decided to give an opportunity to the candidates to correct their wrongly entered data by way of using Edit Option. In this regard, the candidates are directed to go through the following instructions. 1. Candidates are strictly informed that this Edit Option will be considered for one time only. Hence, the candidate should exercise utmost care while using Edit Option as this Data will be considered up to final selection. Must possess a Diploma in Physiotherapy from a recognized institution or an equivalent qualification. a) FEE: (Remittance of Fee) Each applicant must pay Rs. 200/- (RUPEES TWO HUNDRED ONLY) towards Online Application Processing Fee. This apart, the applicants have to pay RS. 80/- (RUPEES ONE HUNDRED AND TWENTY ONLY) towards Examination Fee. However, the following category of candidates belonging to Telangana State only are exempted from payment of Examination fee. 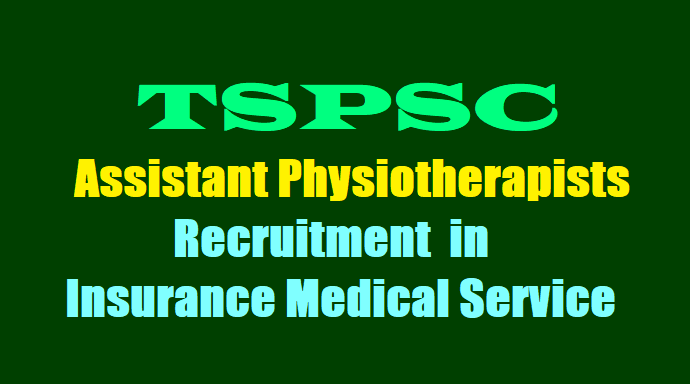 TSPSC Assistant Physiotherapists Recruitment, Hall tickets 2017: Hall tickets can be downloaded 7 days before commencement of Examination. The candidates who applied for the posts of Assistant Physiotherapist (45/2017) are requested to note the examination dates for various posts as mentioned herewith.